If you need a loan to finance your property purchase, or for business investment or children’s education, you may be put off by the current tight lending environment. However, if you have a property under a mortgage for some years, you can actually make use of the property’s increased market value to apply for a new loan from banks. Called mortgage refinancing, the new mortgage will be used to pay off or redeem the existing mortgage in the process, using the property as collateral, explains RHB Banking Group head of group retail banking U Chen Hock. For example, let’s say a borrower’s existing mortgage has been with Bank A for 10 years, with a remaining tenure of 15 years. The original loan amount of RM300,000 has been paid down to RM200,000. The borrower could consider refinancing the mortgage by taking a new mortgage from Bank B for the remaining RM200,000. The new loan of RM200,000 will be used to pay off the original loan with Bank A. The maximum loan tenure of the new mortgage could be up to 35 years, or when the borrower is 70 years old, whichever is earlier. If there is a need for extra cash, the borrower could actually seek a higher refinancing amount, subject to meeting the new financier’s margin of financing requirement, U adds. “This is based on two conditions. First, the amount of principal that you have paid down over the years, which is, using the above example, the RM100,000. Second, the appreciation in the value of your property, or both factors,” U elaborates. The cash-out amount can be used as business capital, house renovation cost, children’s education fund, or even to buy another property, he says. “It should be noted that the repayment tenure of the cash-out amount is capped at 10 years, according to the guidelines issued by Bank Negara Malaysia, but some banks will approve tenures of more than 10 years, if the borrower has good repayment capability,” Liew adds. 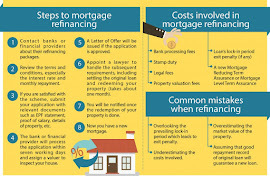 Besides helping you get some cash, mortgage refinancing can result in lower instalments and better loan management. The most common reason for refinancing is to enjoy lower interest rates, says Liew, adding that the current low interest rate environment offers good opportunities to refinance loans. “The lower interest rate can be enjoyed while maintaining the remaining tenure of the original loan. This will reduce the monthly instalment compared with the original one,” he explains. 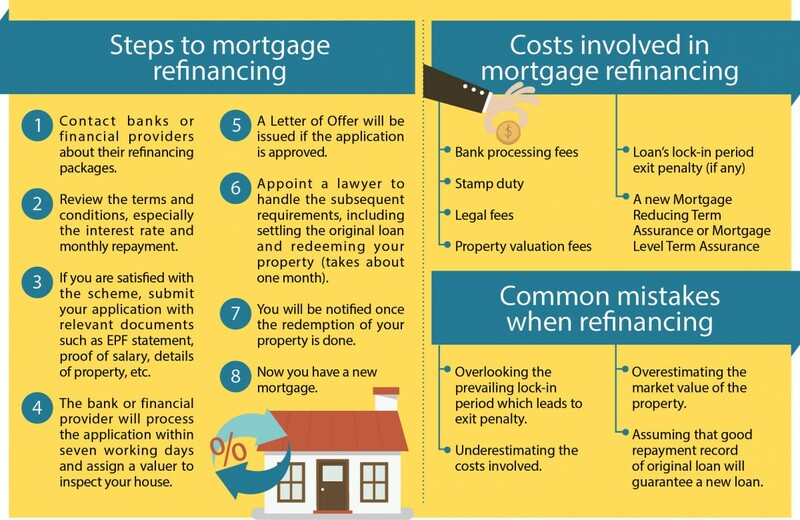 Meanwhile, U notes that one of the benefits of mortgage refinancing is that the process can be used to consolidate multiple loans into one to suit the borrower’s repayment capacity. “Mortgage products have evolved over the years and you can refinance to take advantage of the latest mortgage feature, namely the flexi feature which allows you to prepay at any time with the objective of interest savings, and re-draw the prepaid amount in case of need,” he adds. However, Liew does not encourage borrowers to refinance their loans if the original loan has a remaining tenure of less than 10 years or the difference between the interest rates is minor. “Mortgage refinancing involves a lot of cost, such as bank processing fees, stamp duty, valuation fees and legal fees, so it is not worth doing it if the original loan is almost at the end of its tenure and the new interest rate is only less than 1% of the original,” he says. U also reminds borrowers of a possible penalty charge. “If your original loan has a lock-in period, the redemption of the loan could lead to an exit penalty as stated in the original Letter of Offer. This is a common oversight when considering mortgage refinancing,” he points out. In addition, there is a risk of costlier insurance premium for Mortgage Reducing Term Assurance (MRTA), or running the risk of a rejection of coverage by the insurance operator as the borrower will need to apply for a new MRTA for the new mortgage, he says. U also notes the common misconception about mortgage refinancing. For instance, borrowers often assume that their new mortgage will be automatically approved if they have maintained good repayment behaviour of the existing mortgage.